During 2018-24, Saudi Arabia is anticipated to be one of the key contributing countries in the overall Middle East air compressor market attributed to infrastructural projects in oil & gas sector, industrial development as well as growing construction sector over the coming years. Additionally, government reforms and mega developmental projects announced by the government and private companies such as educational institutions, hotels and office spaces would propel the demand for air compressors in Saudi Arabia. According to 6Wresearch, Saudi Arabia air compressor market size is forecast to grow at a CAGR of 3.1% during 2018-24. Major drop in oil prices in 2015 led to the downfall in construction and oil & gas industry resulting in negative growth of Saudi Arabia air compressor market. Post 2017, the market is expected to revive due to increase in the oil prices after years of slump and shift towards non-oil sector would drive the growth of Saudi Arabia air compressors market over the next six years. The ambitious Saudi Vision 2030 plan to improve the economy is exhibited to revitalize the construction market. The Eastern region occupies maximum share of air compressor market due to the presence of major oil companies such as ARAMCO and SABIC. Moreover, ongoing and upcoming infrastructural advancement are escalating the growth of air compressors in Saudi Arabia. In Saudi Arabia, rotary air compressors captured majority of the Saudi Arabia air compressor market share in 2017, and is expected to dominate during the forecast period. Centrifugal air compressors are also growing at a healthy rate and are expected to expand in the coming years. Oil & Gas, construction and industrial applications garnered maximum revenue share from the air compressor sales due to steady growth of large scale projects. Applications such as construction and oil & gas are projected to grow at relatively higher CAGR during 2018-24. The Saudi Arabia air compressor market report thoroughly covers Air Compressor market by types, technology, power rating, lubrication method, applications, and regions. 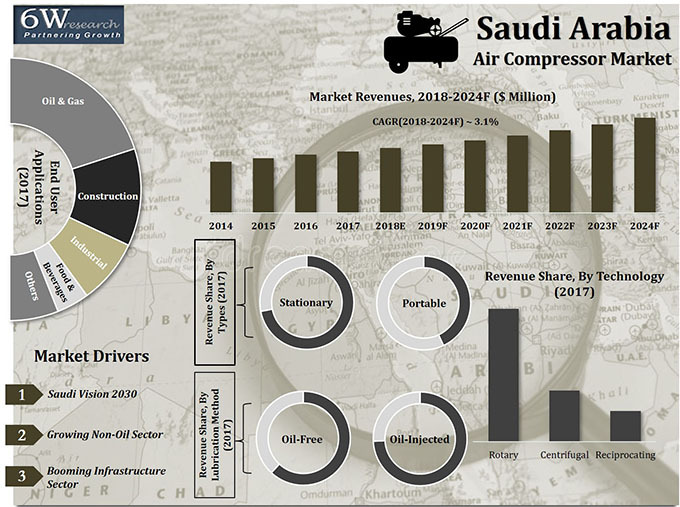 The Saudi Arabia Air Compressor market outlook report provides an unbiased and detailed analysis of the Saudi Arabia air compressor market trends, opportunities/high growth areas and market drivers, which would help the stakeholders to decide and align their market strategies according to the current and future market dynamics. 17.3. Doosan Infracore Co. Ltd.
17.9. Hokuetsu Industries Co. Ltd.